Marketers have realized that the quest to attract eyeballs (let alone, the right eyeballs) isn’t as easy as it used to be. With too much noise on too many channels, people are actively trying to reduce the amount of advertising messages in their life. While marketers have figured out what doesn’t work, many aren’t sure of an alternative approach. The answer lies in giving prospects and customers what they want. People are looking for answers to their questions, for ways to make their lives better, and for inspiration. The brands that succeed are the ones that provide these things for their prospects and customers. Rather than spraying interruptive, self-serving marketing messages, smart marketers are reimagining the content creation process so that their content meets the specific needs and desires of their target market. This type of marketing is called inbound marketing. 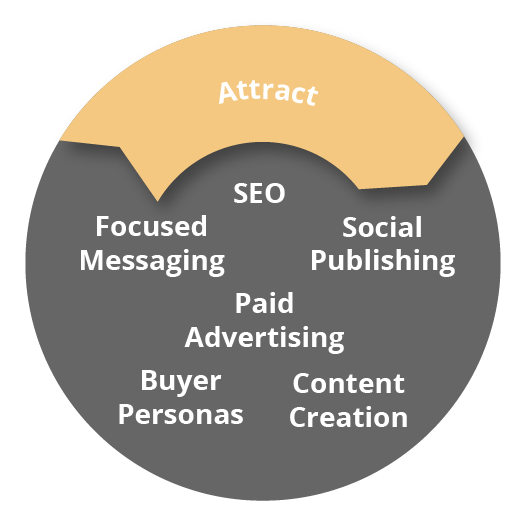 Inbound marketing attracts prospects, engages them, and delights them. This experience prompts your prospects not only to buy, but also to spread the word to their family, friends, and colleagues. 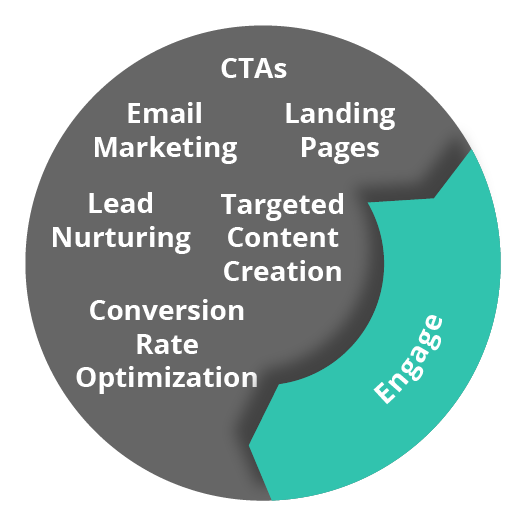 The inbound way of marketing is organic, self-sustaining, and it snowballs over time. Inbound marketing is digital marketing on steroids, and unlike outbound marketing, it doesn’t require interrupting your prospects. By designing content that addresses the needs and desires of prospects, brands can build trust and make prospects more responsive to their business. 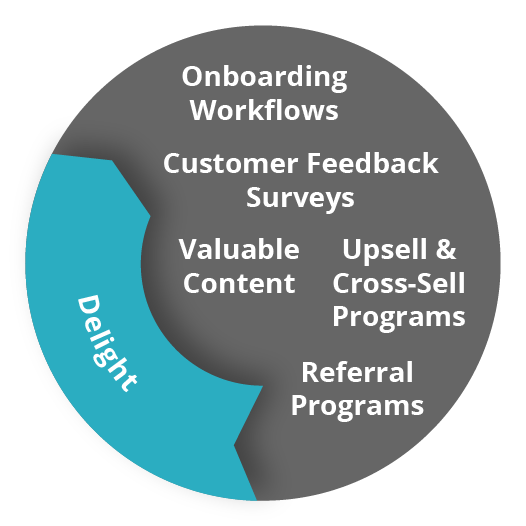 The inbound methodology aligns marketing and sales teams, getting them working together toward a common goal. The marketing team focuses on attracting prospects at the point of interest (lead generation), while the sales team converts those qualified leads through engagement, and the customer service team delights buyers as they fulfill the purchase. The end result is new customers who are both happy and who want to share their experience with others. HubSpot, a sales and marketing software platform (which we love so much that we became a partner), popularized the inbound methodology. 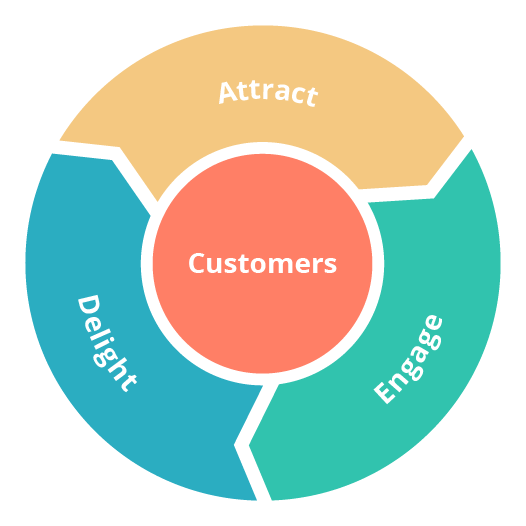 It has three stages, based on a flywheel model: Attract, Engage, and Delight. Attract — This is the stage where prospects encounter your content and interact with your company for the first time. The focus at this stage is providing value to the prospect. Engage — At this stage, you engage prospects that are interested in becoming customers. The focus at this stage is on making the purchasing process easy, removing as many obstacles in the buyer's journey as possible. Delight — In this stage, your focus is on generating happiness for customers by making life simpler and continuing to solve their problems. The focus is on making your customers successful so that your company, in turn, can be successful. All of the services we provide at Lone Fir are focused on building these stages into your marketing process. We are a full-service strategy and implementation team, but you can purchase any of these inbound marketing services from us a la carte. Your flywheel will function best if you have all of them in place — either delivered by your team or by a partner like Lone Fir. Wait, what happened to the funnel? The marketing funnel only tells part of the business growth story. Buyer Personas — Buyer personas are well-researched representations of your customers. They allow your team to see, at a glance, what your prospects are interested in, what their desires are, what they struggle with, what their goals are, what their fears are, and their demographic characteristics. Your buyer personas will guide your entire marketing strategy. They’ll help you make sure that the content you’re creating will actually resonate with your target market. Focused Messaging — You need to be very clear on exactly what your company provides, how you provide it, and who you provide it for. We believe that the most effective way to do that is through a simple messaging framework — which will make your message memorable and engaging to your target audience. If your message is unclear, you’ll lose prospects. Without focused messaging, your prospects will click the back button and search for a more clear answer somewhere else on the web. Top-of-the-Funnel Content — Top-of-the-funnel content comes in many forms, including pillar posts (like this one! ), blog posts, e-Guides, white papers, and videos. Its defining characteristic is that it’s designed to capture the interest of people who are just beginning to look for a solution to a problem or research something they want. These people aren’t yet ready to buy, but by capturing their interest at this stage, you can nurture them through the research process until they’re ready to buy from you — because you’ve earned their trust through the process. On-Page SEO — Search engine optimization (SEO) will help ensure your content gets found online. It provides a solid foundation for link-building (off-page SEO) that will happen later. Social Publishing — Posting on social media channels will help spread your content to the people you want to see it. By sharing information, articles, graphics, audio clips, and videos that your target audience will like, you’ll prompt people to share your content with their contacts, extending your reach. Paid Advertising — Search engine marketing (SEM), pay-per-click (PPC), social media advertising, and retargeting all help get momentum going when you don’t have an existing audience that’s following your social channels. Paid advertising can help you generate a following and can also help fill in the engagement gap when you first start an SEO campaign while you’re waiting for your rankings to rise. Campaign Strategy, Creation, and Management — Effective marketing depends on a well-planned strategy, good execution, and ongoing management. This is where the real work happens. With the right strategy, quality execution, and smart optimization, your inbound marketing program will get results. Website Design — Web design matters. You need a hub where all your great content will live. You also need a place to share stories of how you’ve helped your customers and the background of your company. A well-designed, well-organized website that’s easy to use will accomplish this for you. Sales Prospecting Framework — Prospecting is another way to share your content with your target market. Old-school prospecting was about cold outreach and multiple attempts to “follow up” (resulting in annoyed prospects.) This approach has been replaced with outreach to targeted prospects where your sales team shares truly valuable content. This type of prospecting is not only more effective; it’s also more enjoyable for your sales team to do. Now that you have your audience’s attention and you’ve helped them along the research process, it’s time to start thinking about nurturing and converting qualified prospects. Here are the services we offer to help you in this stage. Mid-Funnel and Bottom-of-the-Funnel Content — First, you’ll need content that guides prospects further down the buying funnel. This content can take the form of articles, e-Guides, white papers, case studies, or videos, among other things. The key to effective mid-funnel and bottom-of-the-funnel content is to help prospects answer the questions they have at this stage in the buying journey. Good content can help prospects finish their research and make a smart decision (whether or not that decision is to buy from you). Remember, quality content generates quality leads. Landing Pages — Some of the content you create should be gated so that you can capture prospects’ email addresses for the purpose of nurturing. People are reluctant to give up their email addresses, so you’ll need to make gated information ultra valuable. Consider making a good portion of your content ungated, which will generate enough goodwill so that prospects won’t be as hesitant to share their contact details later. Good landing pages will help motivate prospects to fill out your forms and click the submit button. CTA and Conversion Path Building — Getting prospects to take action requires knowledge of conversion optimization and human psychology. People’s natural state is inertia, so you need a strategy for moving prospects to take the next step. Conversion Rate Optimization — If you’re generating some conversions but not enough, you may need conversion rate optimization. This includes everything from changing messaging to moving buttons on your landing pages. There are literally hundreds of points that can be optimized to deliver higher conversion rates. Email Marketing and Lead Nurturing — After you’ve captured a prospect’s email address, you’ll want to nurture them until they’re ready to buy. Email marketing is an ideal way to continue delivering valuable information that prospects will appreciate. You can also send customers emails to promote products and services you know they would be interested in. Sales Templates — Your sales team shouldn’t be reinventing the wheel every time they craft an email. Templates not only save time, they also allow you to A/B test different messages to see which perform the best. Email Sequences — Email sequences automate the follow-up process, making your sales team more efficient. Utilizing marketing automation with thoughtful email sequences can take your engagement to the next level. CRM Implementation — Without a CRM, your sales team is flying blind. A CRM will capture information about your prospects and track all the nurturing activities that each has experienced. At a glance, you can see which prospects are ready to move to the next stage in the buying process. Lead Scoring — How do you know when a prospect is ready to be sent a case study or next-stage type of content? Lead scoring. Each prospect receives a score, and your nurturing campaigns can be customized to reach differently-scored prospects in relevant ways. Sales Skills Training — Your marketing team can be top-notch, but if your sales team isn’t sure how to nurture leads, you could experience a breakdown in the conversion process. Brush up on the basics or dig deep into problem areas. Sales Pipeline Analytics — Find out where your sales pipeline is breaking down so that you know what to fix. Sales Reporting — You can’t improve what you don’t measure. Know exactly how you’re doing at each stage in the sales process. Delight is about making customers so happy that they tell their family, friends, and colleagues how much they love your company. Here’s how we help you create real fans. Feedback Surveys — You won’t really know how you’re doing until you ask your customers. Find out how you can improve and generate new ideas from engaged customers. Onboarding Email Workflows — Help customers get started, thank them for their purchases, and let them know what they can expect next with automated email workflows. Content — Never stop delivering valuable content! Delight-stage content takes the form of product tips, helpful information, and knowledge base answers. This is classic content marketing. Referral Programs — Are you making it easy for customers to send you referrals and share the love? Craft creative referral programs that will prompt customers to spread the word. Upsell and Cross-Sell Programs — It’s easier and cheaper to sell to a customer than it is to a prospect. Upsell and cross-sell with strategic programs that offer related products and services that your customers will appreciate. Imagine your marketing, sales, and customer service teams all working together to attract, engage, and delight prospects and customers. Envision having a cohesive, effective marketing, sales, and customer service program that’s optimized for success. If you’re looking for a partner who can help you craft an inbound strategy and implement it, reach out for a free, no pressure Q&A session. Want to learn more about Inbound Marketing strategy? 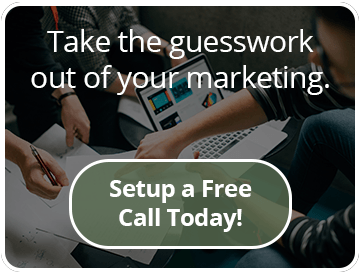 Take the guesswork out of your marketing in just one phone call. Want to learn more how inbound marketing can help your business?